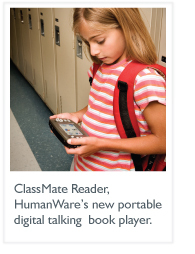 How can one year with the use of HumanWare's new portable digital talking book player the ClassMate Reader, change reading outcomes for college bound students with Learning Disabilities? Over the course of an academic year, integrating audio books and the use of the ClassMate Reader led to significant increases in students' phonetic skills, listening and reading comprehension, as well as fluency. The results were surprising for the instructor who oversaw the assistive technology program. It was the first time students had been able to read material commensurate with their intellect. "Non-readers can now experience what a fluent reader can; reading for pleasure. I can now teach critical reading skills, and teach students how to engage with text and truly comprehend it. 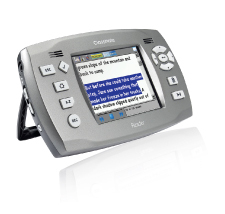 The ClassMate Reader allows students to be independent. They can read, when and where they want, for the first time," claims Alison Gammage Reading Specialist. A total of 29 college bound students identified with severe language based learning disabilities and or ADHD, ranging in grades from 9 -12, participated in the study over a period of 24 weeks at the Lab School of Washington, in Washington DC. All the students were instructed in the use of and had access to a ClassMate Reader as part of a 45 minute assistive technology lesson everyday. For 12 weeks students were able to take the ClassMate Readers home and work independently. A student sharing his experience said, "Now I know why people read books; it's like a movie but the pictures are in your head. If I have a ClassMate Reader I can do my homework without help." The weak reader is always playing "catch up" for the years of reading experience they have already missed. With the integration of the ClassMate Reader, students started reading for pleasure and finally understood the pleasure of reading. When introducing the ClassMate Reader to the students, it was important to examine what we meant by reading. The natural inclination of the students was to believe that using an audio text was 'cheating'. By examining the nature and purpose of reading, students recognized that the value of reading lies in comprehending text and not merely in having good decoding skills. Analogies to how braille is used for the blind, helped students see the role of using an accommodation to fulfill their potential. The role of audio text as a form of remediation was also important for students. They needed to realize that interacting with audio text was more likely to improve their skills than avoiding reading, or reading very little. While listening to the audio, students also tracked the words with their eyes, so visual processing was taking place inadvertently, increasing their decoding and comprehension skills. With increased exposure to the text, students' sight memory of words increased. This data highlights one of the greatest changes in students reading development. 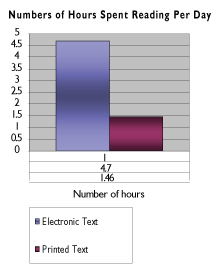 Unlike their teachers, students' natural medium for reading is with electronic text. However, there are important differences in the way students read this material. The type of reading most students are familiar with is purposeful and information driven, with a short engagement time. Students' comprehension skills for this type of reading are radically different than the skills they need to read print. Reading is much more complex with narrative and a defined organisation of ideas. When using the ClassMate Reader, students were, for the first time using electronic text in a different context. They were reading for pleasure not of necessity. Many students with a learning disability rarely read for pleasure and therefore, lack some basic comprehension strategies. They had to be taught how to interact with the text. 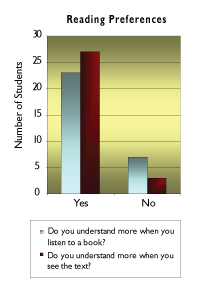 Most were passive readers, not visualizing, predicting or reflecting on what they were reading. Many also wrongly guessed at words they could not read which had become the primary reason for their low comprehension scores. Hearing the text immediately corrected this. Classroom observation quickly showed that it was essential for students to see the text as well as to hear it. Not seeing the text compromised comprehension in three ways. Firstly, the majority of the students had auditory processing difficulties and seeing the text was a visual reinforcement to what they were hearing. Secondly, the majority of students also had a diagnosis of ADHD/ADD and seeing the text improved their ability to stay focused. Lastly, it was important for the student to see the text for the purposes of remediation. When they saw the word as they heard it, they were then able to recognize a word in print format, which they would have typically been unable to read. The majority of the students had weak phonetic decoding ability, and relied on sight memory to read. An unexpected benefit from the project was an increase in students' comprehension scores which had been low due to poor fluency. It was clear that some students' comprehension was affected by the inability to divide and switch attention between decoding individual words and processing the meaning of what was being read. Hearing the book, removed the need to use decoding skills at the same time as comprehending; this allowed the student to focus more working memory on higher order comprehension skills, influencing, cause and effect, predicting etc. This use of the ClassMate Reader changed the nature of the task, by reducing the need to multitask; more working memory was freed up for comprehending. The above may be the most significant factor that contributed to the improvement of the scores in 'letter word ID' and 'fluency' subtests of the WJ raw scores. It is clear that there was significant remediation through the use of the assistive technology. The majority of students' sight memory for words increased throughout the year. Being able to see the word at the same time they were hearing it allowed the students strong visual skills to compensate for their weaker auditory discrimination and processing skills. It was also possible to see students who had good comprehension, obtain greater gains when they could access the text, as opposed to students who had comprehension difficulties due to other cognitive factors. It is evident from this project that students benefit from the use of the ClassMate Reader making a difference in their reading fluency and comprehension skills. With the proper implementation of assistive technology and training, we continue to see the results of improved reading comprehension and fluency skills. There are a variety of studies done with similar results. HumanWare would like to thank the Lab school of Washington for their support of the students and a special thanks to Alison Gammage for providing the students with the resources to implement a technology program that produced these results and for compiling the results of the study. 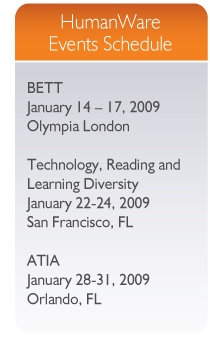 HumanWare is the global leader in assistive technologies for the print disabled. HumanWare provides products to people who are blind or have low vision, and persons/or individuals with learning disabilities. 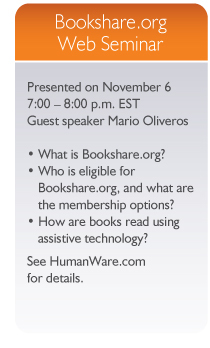 HumanWare offers a collection of innovative products, including BrailleNote, the leading productivity device for the blind in education, business, and for personal use; the Victor Reader product line, the world's leading digital audiobook players; myReader2, HumanWare's unique "auto-reader" for people with low vision; and the ClassMate Reader, the only portable book player to offer synchronized text and audio for individuals. ©2007 HumanWare. Unsubscribe from this newsletter.